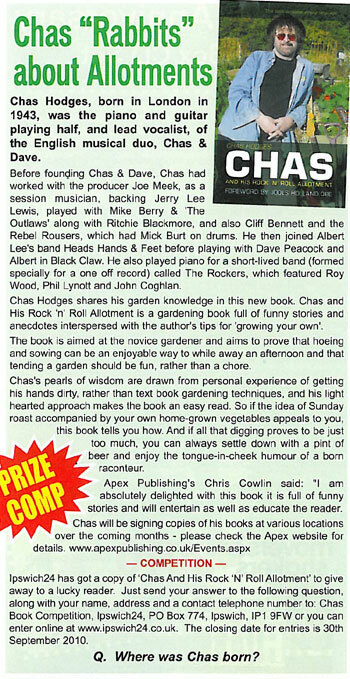 Brief Description: Chas and His Rock ‘n’ Roll Allotment is a gardening book like no other. Written by Chas Hodges, better known as half of musical duo Chas and Dave, the book is full of funny stories and anecdotes interspersed with the author’s tips for ‘growing your own’. The book is aimed at the novice gardener and aims to prove that hoeing and sowing can be an enjoyable way to while away an afternoon and that tending a garden should be fun, rather than a chore. 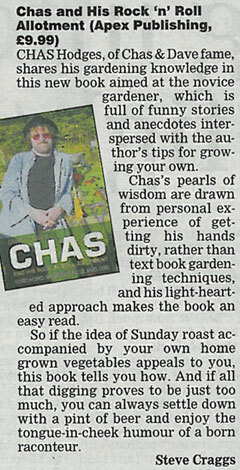 Chas’s pearls of wisdom are drawn from personal experience of getting his hands dirty, rather than text book gardening techniques, and his light hearted approach makes the book an easy read. So if the idea of Sunday roast accompanied by your own home grown vegetables appeals to you, this book tells you how. And if all that digging proves to be just too much, you can always settle down with a pint of beer and enjoy the tongue-in-cheek humour of a born raconteur. Special Note: A previous edition of the eBook version carries the following ISBN's: 978-1-908548-32-0 and 978-1-907792-06-9. About the Author: Singer/songwriter/producer Chas Hodges, born in London in 1943, is better known as the lead vocalist and piano- and guitar-playing half of the English musical duo, Chas & Dave. With a musical mother, who played piano in pubs and clubs to support the family after the untimely death of his father when he was aged four, it wasn’t long before Chas was bitten by the bug. He learned to play the guitar and was soon in his first band, ‘Horseshoe Skiffle Group', aged 14. Then, after seeing Jerry Lee Lewis in concert in 1958, his musical aspirations expanded to piano playing. Rock ‘n’ roll was now on the rise and, armed with his new Höfner bass guitar, Chas began playing in various rock ‘n’ roll bands, turning professional at the age of 16. As a session musician Chas worked with producer Joe Meek, backing Jerry Lee Lewis, and played with Mike Berry & The Outlaws (alongside Ritchie Blackmore), Cliff Bennett and the Rebel Rousers and Albert Lee’s Heads, Hands & Feet, rubbing shoulders with many big names of the day. In 1972 Chas got together with friend Dave Peacock with the aim of shaking off American influences and writing/singing songs that reflected their London roots. Thus the group Chas & Dave was born, along with its unique brand of humorous ‘rockney’ (rock/cockney), which combined rock ‘n’ roll, boogie-woogie and pub singalong to produce such memorable hits as ‘Gertcha’ (1979), ‘Rabbit’ (1980), ‘Ain’t No Pleasing You’ (1982) and ‘Snooker Loopy’ (1986), among a wealth of others, as well as several singles dedicated to Tottenham Hotspur Football Club. In 2008 Chas & Dave’s autobiography, Chas & Dave – All About Us, was published, and Chas had a cameo role in the star-studded 2009 Joe Meek biopic, Telstar. 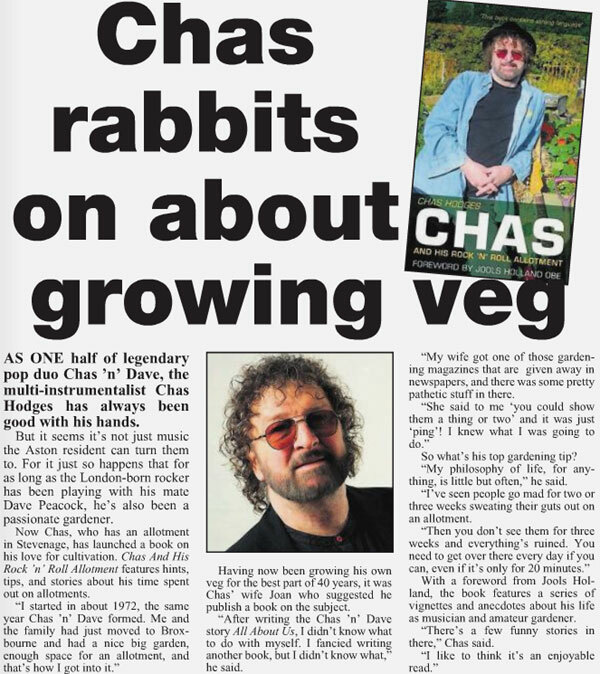 Chas is still gigging, which strikes a harmonious balance with his love of growing his own vegetables, and he has recently released a new album, Chas Hodges. I am delighted to be invited to write the foreword to this excellent book. On checking the gardening section of my library I was disappointed to see how few books there are on the subject of allotments. So it is wonderful to welcome this edition that can at last fill that gap. It’s an illuminating book, written by a great man who has a full understanding of all the pitfalls, the do’s and don’ts of allotmenting. The author is a great Londoner who has recognised, like many of the generations before him, the great pleasure that can be gained from seeing nature at work. Especially when it results in creating delicious things we can put on our kitchen table. Indeed the food grown in the London allotment can often be found in the loftiest dining rooms. I happen to know that in Mark’s Club, one of London’s grandest restaurants, the fruit and veg comes from the headwaiter’s allotments. Also, we must remember, that by growing our own veg it’s one less trip to the supermarket and therefore a few moments less stress each week. So in short, by having an allotment you can eat like a king, save money, your sanity and the planet. So when, we ask “How do I go about having an allotment?” Well you are holding the answer in your hands in the form of this useful book. One word of warning would be, that my dear friend Chas often speaks and writes in the vernacular. This means he might, at the drop of a hat, start speaking in traditional Cockney rhyming slang. So please check the context if he refers to apples and pears, syrup of figs, taters, or being a gooseberry, or you might end up with egg all over your boat (see the poultry section in the book). I wish you many happy hours on your allotment growing food for yourself, family and loved ones whilst at the same time getting away from them all in your potting shed. 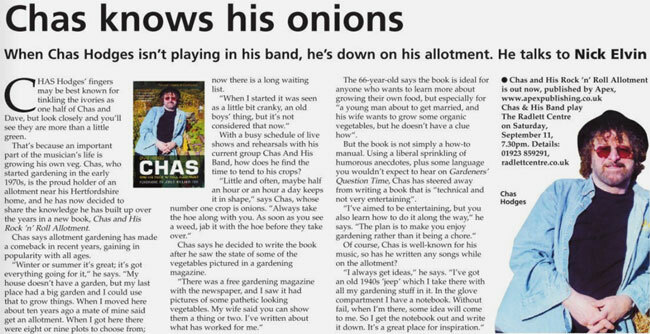 AS he puts it himself, Chas hodges 'f****** loves growing vegetables'. Which is why, rather than meeting him backstage at a gig, or at one of the myriad festivals he's performing at this summer, or watching his beloved Spurs, or just down the pub with the other half of Chas and Dave, Dave Peacock, we're standing in his allotment near Stevenage. And Chas, 66, who is even hairier than your wildest dreams and very lively company, is waving a muddy spade at me and getting worked up about the nightmare that is potato blight. 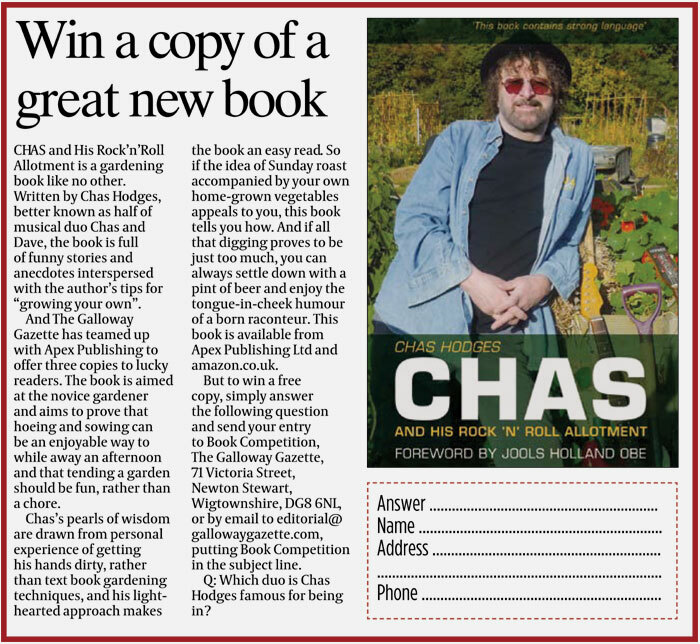 Such is Chas's passion for gardening that he's recently written a book all about it called Chas And his Rock 'N' Roll Allotment. It's crammed full of anecdotes, extremely colourful language, 'I tried, but I found it too hard to write this book without what I call my "perfect punctuation" ', glossy photos of Chas with his splendid-looking veg and recipes for pig trotter and rabbit stew. And, of course, his top rock 'n' roll tips for 'growing your own'. Surprisingly, then, his actual allotment is a bit of a let-down. There's a single row of small onions; a handful of tomato plants, 'I don't know what kind, my Italian mate Vito gave me them'; half a row of potatoes; a lonely marrow plant, 'From Vito, again' and a large parsley plant that's gone to seed. And that's about it. The rest is a big empty muddy space, an upsidedown wheelbarrow, a huge pile of manure ready for spreading and a spare fork. 'I'm giving it a bit of a rest this year and treating the soil,' he says. Which means our grand tour is over in ten seconds flat. And Jenny the photographer is left looking wistfully at neighbouring plots overflowing with prize produce. So, with just the pile of manure, two forks and Chas's warning - 'The first time I spread this, I got tendonitis and I couldn't walk the next day' - to tempt us, the chat turns to other things. Such as singing, smoking, swimming, touring, the 'lovely Beatles', the 'f***ing rude Rolling Stones', the perils of drinking a bottle of brandy a day and next year's farewell tour. Oh yes, and the astonishing fact that, after decades churning out beer-stained hits such as Gertcha, Rabbit, Snooker Loopy and Ain't No Pleasing You, cockney rockers Chas and Dave have become - please brace yourselves - the new cool. They've been mobbed at Glastonbury in recent years, have been sampled by bad-boy rapper Eminem, 'he liked one of my guitar riffs so much he used it in his hit song My Name Is', and have been constantly cited by Pete Doherty as a huge musical influence. 'We supported [Doherty's old band] The Libertines at Brixton Academy and we absolutely stormed it,' he says. 'Now we've got their fans shouting "we love you!" It's taken a long time for us to get there, but Chas and Dave have sort of gradually become trendy,' he says with a beaming grin and a slap of his crumpled thigh. No wonder he's delighted. For years despite nine best-selling albums, their own TV show and invitations to Downing Street, their fans were strictly limited to the older and younger members of society, with a barren wasteland (other than, it seems, the late Princess Margaret and Denise Van Outen) in between. 'It didn't bother me. I'd think: "Well, if you don't like the music, then you're missing out and you haven't got much heart." Because if you listen to it properly, it's all heart,' insists Chas. 'But it used to bother Dave. If we got a bad write-up, he'd want to go out and bash them up. Because the surprising thing about Chas and Dave is that they're properly talented. Chas has been playing in bands since Joe Meek enlisted him, aged 16, to play bass in his house band and has toured with some of the greats. Gene Vincent, Ritchie Blackmore and The Outlaws. Then, in 1966, with Cliff Bennett And The Rebel Rousers, Chas supported the Beatles on their final European tour and became one of the first people to hear the album Revolver. 'Paul McCartney called us into their dressing room and we all listened to it for the first time together. When it got to Yellow Submarine and it started, "In the town, where I was born . . . la la la . . ." Paul stared right at me. I didn't know what to make of it - what was I supposed to do, laugh or what? 'Then Got To Get You Into My Life came on and he said: "This would be a great one for your band to do." So, we cut it in Abbey Road and he produced it. 'They were great, which is more than I can say for the Rolling Stones,' he adds darkly. And the Stones? 'We toured with them in 1964 just as they were becoming big and they wouldn't speak to us,' he says, clearly still smarting. But aside from the Stones being stuck up, did they have a good time - was it all rock 'n' roll? And before he hooked up with Dave, whom he met when he thumbed a lift off a mate and Dave was sitting in the back seat. They realised their taste in music was 'identical' and had the Chas and Dave epiphany. And that was the start of Chas and Dave. After they'd decided on the snappy name, that is. Songs such as Top 40 hits Gertcha, Rabbit and Ain't No Pleasing You, TV theme tunes - for Crackerjack and In Sickness & In Health - and football anthems for their beloved Tottenham Hotspur. 'Spurs are on their way to Wembley, la la la, la la la ...' Chas sings obligingly. There was also ' Tottenham, Tottenham, no one can stop them...', the 1991 hit featuring Gazza, 'He's just as wild as they say. Full on all the time', and Snooker Loopy by the Matchroom Mob, which Chas dreamt up by imagining the seven dwarves singing it. And an awful lot of time spent in pubs. They even bought their own in London's East End. And named it, what else, but Chas And Dave's. For Chas, though, the drinking came to a sudden halt in 1999. So he packed it in. 'I did it by myself and it was hard at first. Really hard. I took up swimming instead, so every time I'd usually go to the pub I went swimming. I was swimming all the time! But isn't it a right old pain for his wife Joan - once a bunny girl, now 63, still very attractive and, she tells me, never happy if she doesn't have one of his homegrown onions in her kitchen - to have him come crashing in to bed at 4am every morning? And that's the thing about Chas and Dave. It's always been all about having a laugh. Unlike so many duos, they're proper mates who share birthdays, anniversaries and godchildren. They became interchangeable in our minds - is Chas the chubby hairy one on the piano, or the thin hairy one on the guitar? They split everything 50:50 to avoid rows and, every so often, holed themselves up in a cottage for a fortnight, eating an enormous and disgusting-sounding stew, doing no washing up, drinking and smoking like mad and writing some new material. Or at least they did until last year, when Dave's non-smoking wife of 36 years, Sue, died of lung cancer. He decided he wanted out and Chas and Dave was over. It was all a bit sudden, so happily, a year on, Dave's had a rethink and the pair have recently announced a final farewell tour for next year. And then that, says Chas, will be that. Really, truly, the end of Chas and Dave? 'Yeah. Deep down, it's never really been Dave's thing. He restores Romany caravans, that's his thing. There's nobody better than Dave when it comes to Romany caravans. Ah, of course, the allotment, I'd almost forgotten. Where there's still an awful lot of muck to spread and very few vegetables. 'Spreading manure tightens your stomach muscles,' he says, jiggling his wobbly tummy. 'Can't you feel it? 'But the main thing is not to overdo it. Far too many people go f****** mad for three weeks, treating it like painting a house, then you don't see them for two months. 'Better to do it little and often and get to know some of the lovely people down here - there are solicitors and all sorts. And with that and one last glance at his very empty plot - maybe it's rabbits? - we say our farewells. Me clutching a very small onion, 'Have that for your tea, love' and him beaming from ear to ear and waving his muddy spade. 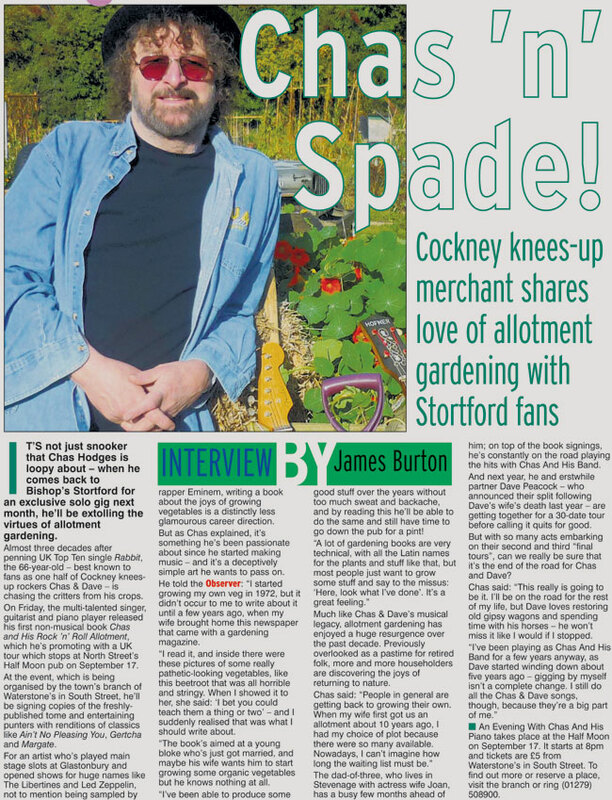 Chas Hodge's allotment might be a bit short of actual vegetables, but it's a great place for a chat and you'd struggle to meet a jollier, more modest, or hairier chap. Other than Dave, perhaps. ROCK ‘n’ roll musician Chas Hodges shared his top planting tips at the launch of his new gardening book at a Great Amwell garden centre. 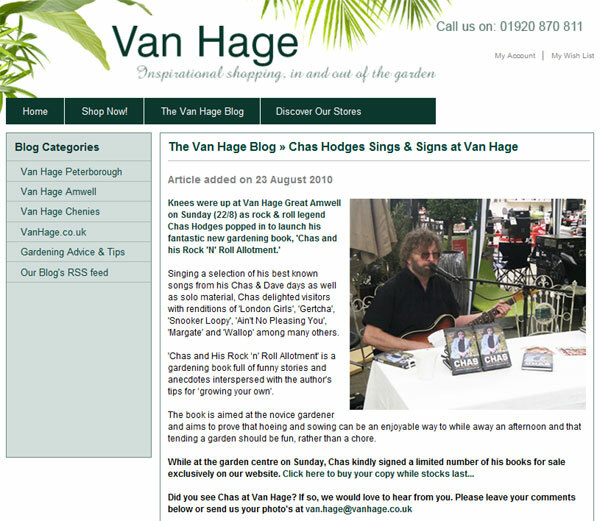 Chas HodgesThe singer, who is one half of the former duo Chas ‘n’ Dave, signed copies of Chas and his Rock ‘N’ Roll Allotment at Van Hage in Pepper Hill on Sunday, while entertaining visitors with his songs. Store webmaster Phil Blackwell said: “It was really popular and a bit surreal. The book features Van Hage’s carrot flak seeds. Both bizarre and brilliant, a lovely fella too. 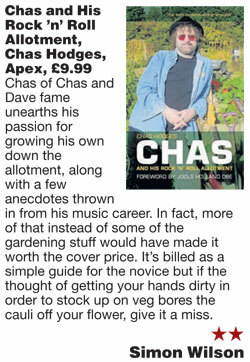 GARDENING is the new rock and roll, and that's official according to Chas & Dave star Chas Hodges. The Cockney rocker who will be playing Herne Bay later this month is bringing out a gardening book. But the man who brought us Rabbit and Down To Margate doesn't pull his punches with his grown-up growing tips. 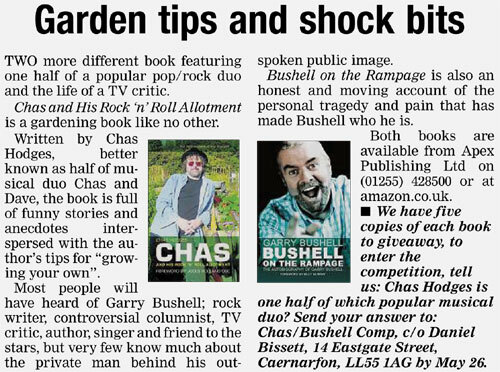 The book, Chas and his Rock and Roll Allotment, is peppered with saucy anecdotes and the F-word which may upset some fans. But he doesn't care. He is just happy to be sharing his joy of potato sacks, weeding, planting and harvesting. In fact, when he calls Times Towers, he has just returned home from a 45-minute stint on his allotment. He revealed: "The secret is a little and often. Many people take on a plot and go mad for a couple of weeks weeding and clearing. Then you don't see them for three weeks because they've knackered themselves out. "They start to look at it as work and it isn't, it's a pleasure." 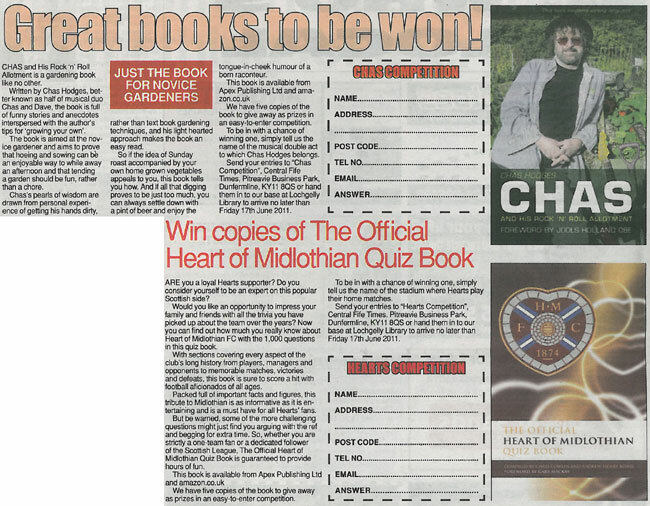 Gardening Chas-style certainly seems more fun than some of the other experts trying to spread the word. As well as practical advice, his book includes recipes and more than a few anecdotes involving animals, his friends – and quite a lot of poo. He admitted: "It's not a typical gardening book – it's aimed at a bloke who has a wife who wants him to grow vegetables for the family when he'd rather be down the pub. I can help him make time for both. "Gardening is really enjoyable to me. It's amazing how many ideas I have when I'm out there digging and weeding." The seeds of his career as a writer were sown 20 years ago when he and former band mate Dave Peacock decided to tell their story and started writing down their memories. 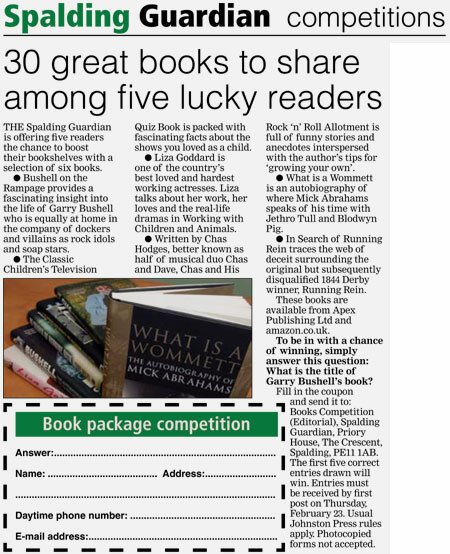 Pianist Chas, 66, said: "I really enjoyed it and quickly filled an exercise book. A few weeks later, Dave asked how I was getting on. He had only managed to fill one side of A4 – and that was from his birth to then! "When I showed my work to the writer who was going to be our editor he said I didn't need him and could write it myself, so I did. "After the book was finished I missed it and wanted to write something else." His wife Joan suggested he write a gardening book after showing him a leaflet of tips. Chas said: "It had a pathetic stringy beetroot on the cover. Joan said I could show them a thing or two so I started putting down all the things I'd learned over the years and it all grew from there." Not one to let the grass grow under his feet, Chas has also just released an album, Chas and his band Live, and is preparing for a farewell tour with Dave next year. Dave quit the band last year after his wife Sue died but will team up with his old pal for one final nationwide tour. 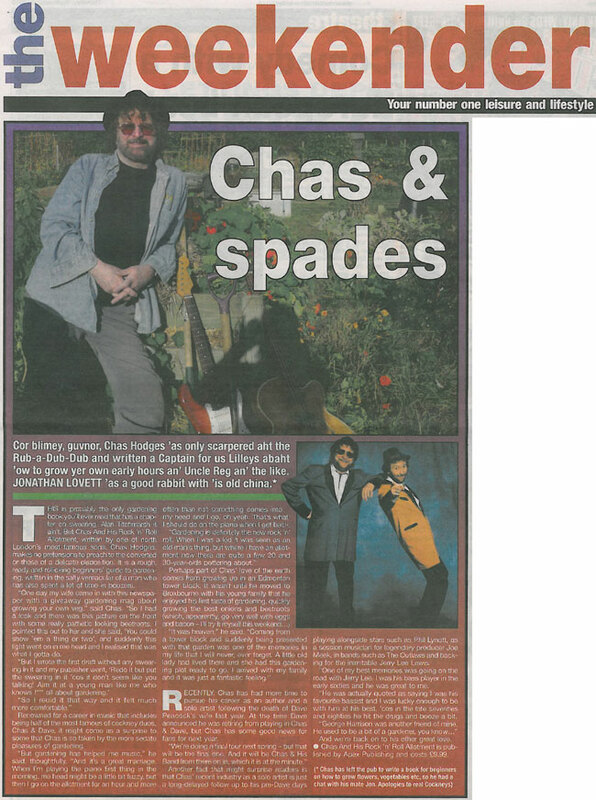 Chas said: "It will be a proper farewell tour and should be good. I'll go on forever but Dave doesn't want to do any more after this." His Herne Bay gig will be with his new band, including Darren Juniper, bass-playing son of Brian Juniper who first introduced Chas to Dave. The new band has been nicknamed Chas and Daz in Darren's honour. Last year they headlined the Herne Bay Festival and packed out the seafront. But this year have been snubbed in favour of a Motown tribute act. Instead, Chas will be playing Strode Park's Theatre in the Park the same night as the Motown Gold gig – Saturday, August 28. Chas said: "It's a bit of a drag the organisers decided to book the tribute act but I'm really looking forward to going back to Herne Bay anyway. "I love performing and that comes across at the gigs. You can't hide it if you are not enjoying it – but I love it. "Gardening and music go together very well. I wouldn't give one up to do the other and I'm lucky I can do both." So what is his best tip? "I would always go with onion sets," he said. "Wee the plot and start in March. Press the tiny onion into the ground and as they get bigger pick every other one off for salad and leave the rest to grow. They are a must for me." 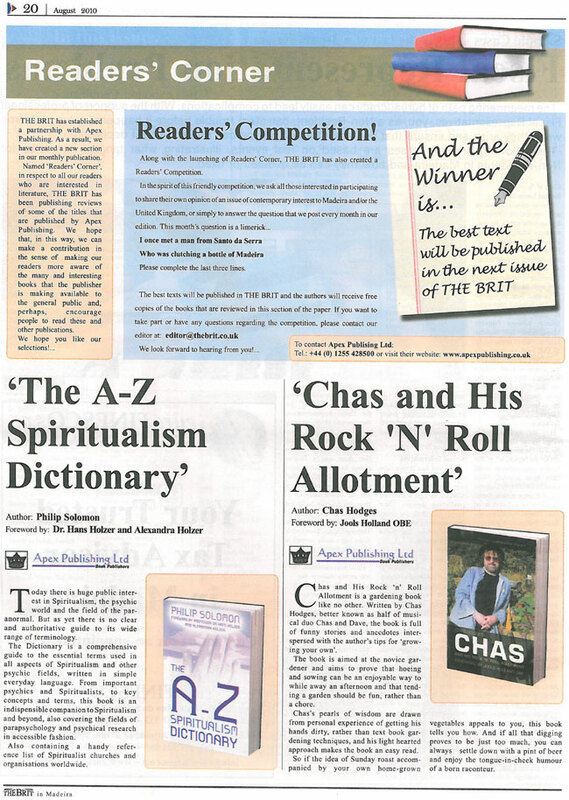 ● Chas and his Rock and Roll Allotment is available from bookshops and online from August 20, priced £9.99. ● Chas and his band will be playing at Strode Park, Herne, on Saturday, August 28. Tickets are £15 from http://www.strodepark.org.uk or 01227 373292. Chas Hodges is well known as half of the Cockney duo, Chas ’n’ Dave. Well loved for their toe tapping tracks including Gertcha and Rabbit, it turns out that one of Chas’ own passions is growing veg. 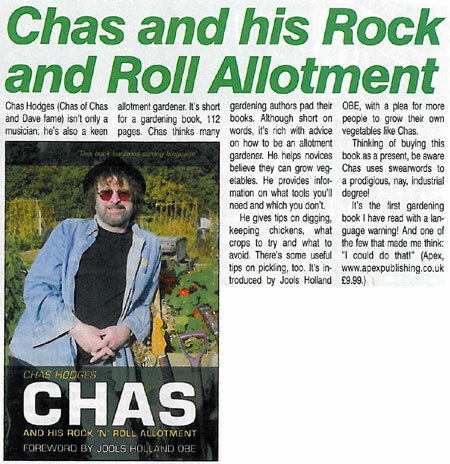 His latest book, Chas and His Rock ’n’ Roll Allotment has just been published and he explains how he learnt to grow his own. “I discovered the joys of gardening years ago when the family were young and we bought a bungalow from an old lady in Broxbourne,” he said. “She had kept the garden like an allotment all through the war so when we moved in, it was already to go. “I was only 28 so had loads of energy but little knowledge about how to keep the garden going; the best thing of all was that she moved in with her sister next door and between them, the two old ladies, Glad and Grace, soon put me straight. Chas continues to explain how the pen became mightier than the spade. “I had already written a couple of books and when I’d finished them I still had the bug to write more. “So I wrote a novel about a man who wants to please his wife by growing veg. The trouble is he doesn’t have a clue and doesn’t even know what a trowel is. It’s all about how I learnt myself really, so I approached it like it was my life. “He ended up growing great veg and pleasing his wife and still had time to go down the pub. I wanted it to be educational and entertaining. If gardening becomes a task then you’re doing something wrong. You shouldn’t let it be a chore. “For example I find growing cabbages a chore; they need a lot of looking after and are too popular with the birds and caterpillars, so I don’t bother. I stick to onions and spinach. They’re both easy to grow and good for you. “I’m planning to write another book next year, as I’ve redone my allotment. “I’ve dug it all over and will manure it and rotovate it so it’s all ready to start from scratch from January next year. Chase tries to be self-sufficient and uses gardening to relax and keep fit. “I’m still on the road doing gigs, so it’s good to be fit. I’m really enjoying life, if I don’t do a gig every week I feel something’s missing. 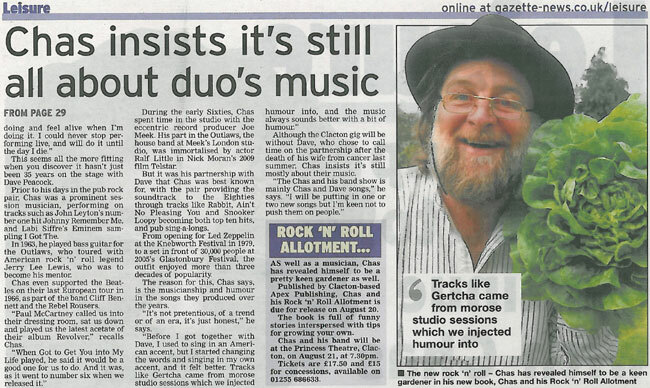 We’re called Chas And His Band now and still do a lot of the Chas ’n’ Dave stuff as well as some new songs. “My grandson Harry came in from the garden the other day after picking potatoes and started singing about ‘tay-ters’, so I’ve started writing a song about them. See http://www.chashodges.com to find out more. There are gardening books… and gardening books. 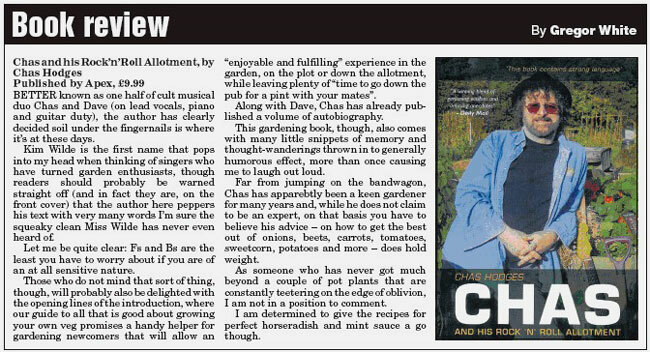 ‘Chas and his rock ‘n’ roll allotment’ is a breath of fresh air. 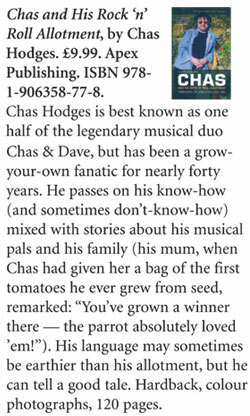 Irreverently but caringly penned by singer, song writer/producer Chas Hodges, the other half of the famed musical duo Chas and Dave, it’s a winning blend of gardening wisdom and amusing anecdotes. Aimed at budding gardeners, there’s no pretence. 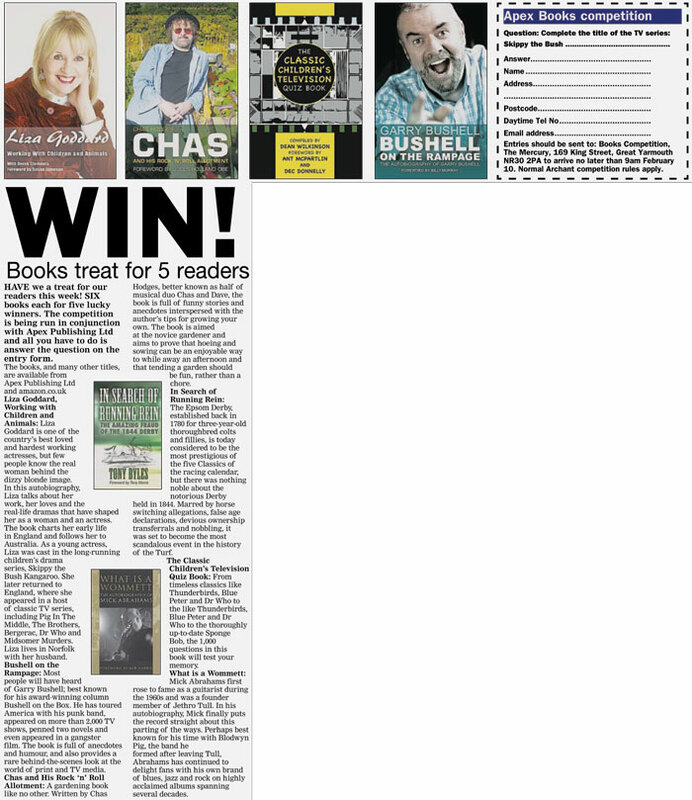 Chas gardens well and is keen for to you emulate his tried and tested practices. Packed with down-to-earth advice on which tools to use and best crops to grow, it will kick start the most reluctant gardener into succeeding with his plot. Chas takes you by the hand, helps you avoid the pitfalls and gets you growing. This has to be the most hilarious gardening book I've ever read. Truth to tell, its the only gardening book I've ever read, but its still hilarious. If you ever wanted to do an in-depth study of the problem of dog turds on lawns, then this book is for you. Absolutely side-splitting. It is like the mess room banter of my early apprentice gardener days, when the conversations were all about gardening and everything else in the world all at once. I would emerge from break times with tears streaming down my face from painful paroxysms of laughter. AS one half of legendary pop duo Chas ‘n’ Dave, the multi-instrumentalist Chas Hodges has always been good with his hands. But it seems it’s not just music he can turn them to. 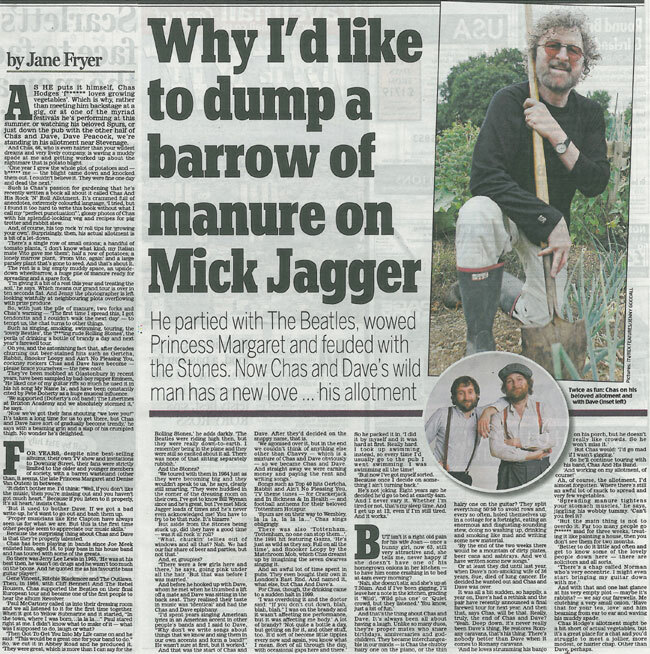 For it just so happens that for as long as the London-born rocker has been playing with his mate Dave Peacock, he’s also been a passionate gardener. 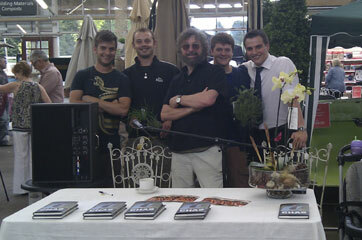 Now Chas is about to launch a book on his love for cultivation. 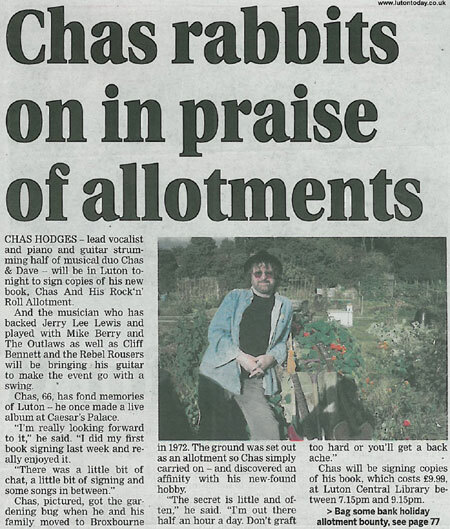 Chas and his Rock ‘N’ Roll Allotment is due for release next month, featuring hints, tips and stories about his time spent out on the allotments of Hertfordshire. Having now been growing his own veg for the best part of 40 years, it was Chas’ wife, Joan, who suggested he publish a book on the subject. "There’s a few funny stories in there. I like to think it’s an enjoyable read." “After writing the Chas and Dave story [All About Us], I didn’t know what to do with myself. I fancied writing another book, but I didn’t know what. “My wife got one of those gardening magazines that get given away in newspapers, and there was some pretty pathetic stuff in there. So what’s his top tip for would-be garden enthusiasts? “My philosophy of life, for anything, is little but often. I’ve seen people go mad for two or three weeks sweating their guts out on an allotment. With a foreword from Jools Holland, the book features a series of vignettes and anecdotes about his life as both a famous musician and amateur gardener. “There’s a few funny stories in there,” Chas said. 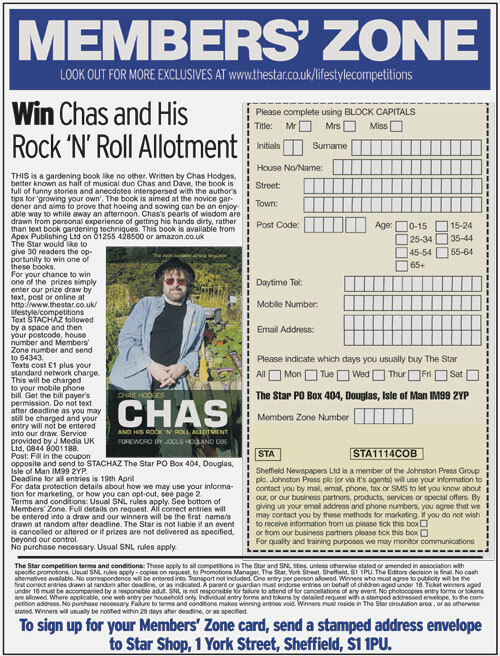 Chas and his Rock ‘N’ Roll Allotment is released on August 20. 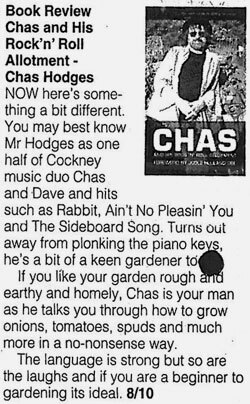 Chas and his Rock’n’Roll Allotment, by Chas Hodges. BETTER known as one half of cult musical duo Chas and Dave (on lead vocals, piano and guitar duty), the author has clearly decided soil under the fingernails is where it’s at these days. Kim Wilde is the first name that pops into my head when thinking of singers who have turned garden enthusiasts, though readers should probably be warned straight off (and in fact they are, on the front cover) that the author here peppers his text with very many words I’m sure the squeaky clean Miss Wilde has never even heard of. Let me be quite clear: Fs and Bs are the least you have to worry about if you are of an at all sensitive nature. Those who do not mind that sort of thing, though, will probably also be delighted with the opening lines of the introduction, where our guide to all that is good about growing your own veg promises a handy helper for gardening newcomers that will allow an "enjoyable and fulfilling" experience in the garden, on the plot or down the allotment, while leaving plenty of "time to go down the pub for a pint with your mates". Along with Dave, Chas has already published a volume of autobiography. This gardening book, though, also comes with many little snippets of memory and thought-wanderings thrown in to generally humorous effect, more than once causing me to laugh out loud. Far from jumping on the bandwagon, Chas has apparebtly been a keen gardener for many years and, while he does not claim to be an expert, on that basis you have to believe his advice - on how to get the best out of onions, beets, carrots, tomatoes, sweetcorn, potatoes and more - does hold weight. As someone who has never got much beyond a couple of pot plants that are constantly teetering on the edge of oblivion, I am not in a position to comment. I am determined to give the recipes for perfect horseradish and mint sauce a go though. 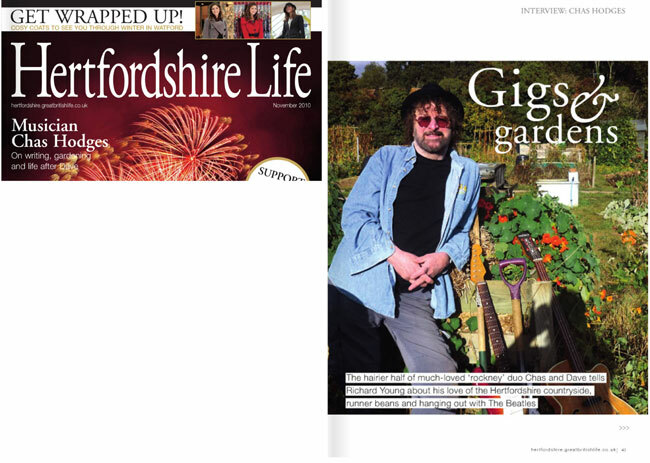 IT’S not just snooker that Chas Hodges is loopy about – when he comes back to Bishop’s Stortford for an exclusive solo gig, he’ll be extolling the virtues of allotment gardening. 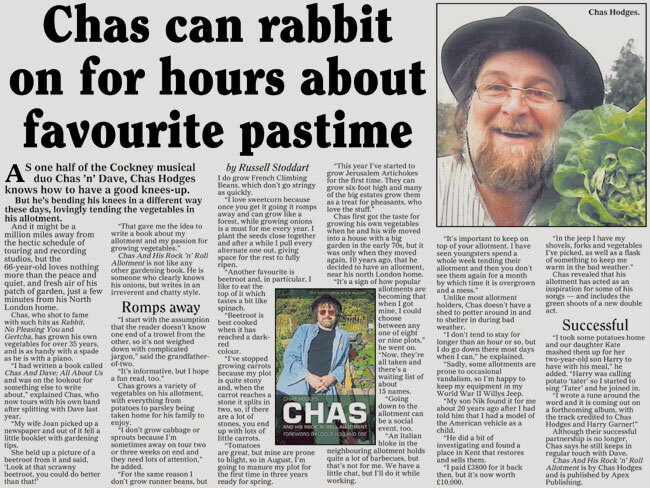 Chas HodgesAlmost three decades after penning UK Top Ten single Rabbit, the 66-year-old – best known to fans as one half of Cockney knees-up rockers Chas & Dave – is chasing the critters from his crops. 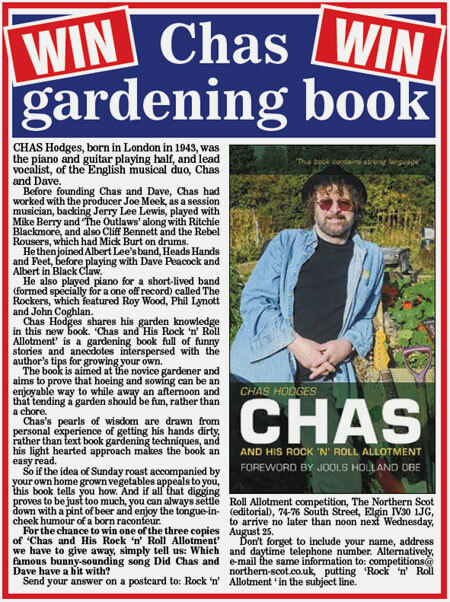 The multi-talented singer, guitarist and piano player has just released his first non-musical book Chas and His Rock ’n’ Roll Allotment, which he’s promoting with a UK tour stopping at North Street’s Half Moon pub on September 17. At the event, organised by the town’s branch of Waterstone’s in South Street, he’ll be signing copies of the freshly-published tome and entertaining punters with renditions of classics like Ain’t No Pleasing You, Gertcha and Margate. For an artist who’s played main stage slots at Glastonbury and opened shows for huge names like The Libertines and Led Zeppelin, not to mention being sampled by rapper Eminem, writing a book about the joys of growing vegetables is a distinctly less glamourous career direction. But as Chas explained, it’s something he’s been passionate about since he started making music – and it’s a deceptively simple art he wants to pass on. He told the Observer: “I started growing my own veg in 1972, but it didn’t occur to me to write about it until a few years ago, when my wife brought home this newspaper that came with a gardening magazine. “I read it, and inside there were these pictures of some really pathetic-looking vegetables, like this beetroot that was all horrible and stringy. When I showed it to her, she said: ‘I bet you could teach them a thing or two’ – and I suddenly realised that was what I should write about. “The book’s aimed at a young bloke who’s just got married, and maybe his wife wants him to start growing some organic vegetables but he knows nothing at all. 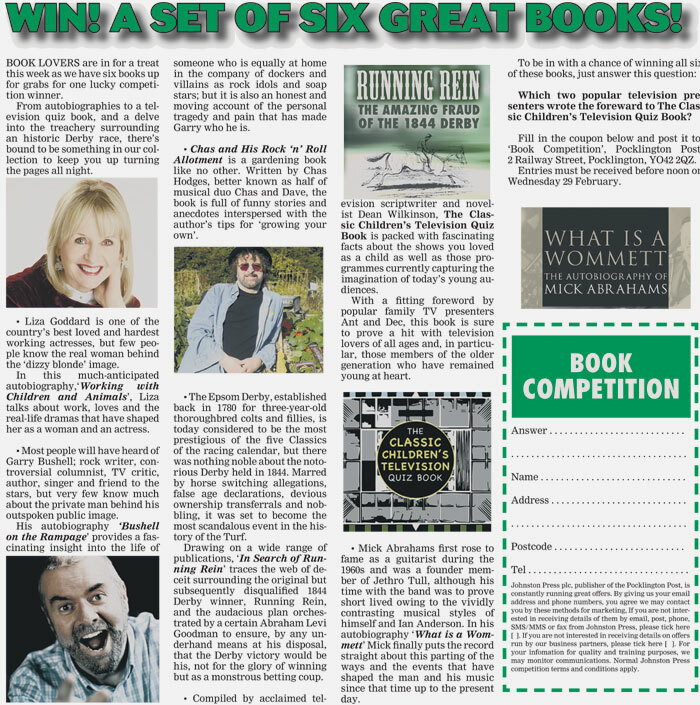 “I’ve been able to produce some good stuff over the years without too much sweat and backache, and by reading this he’ll be able to do the same and still have time to go down the pub for a pint! 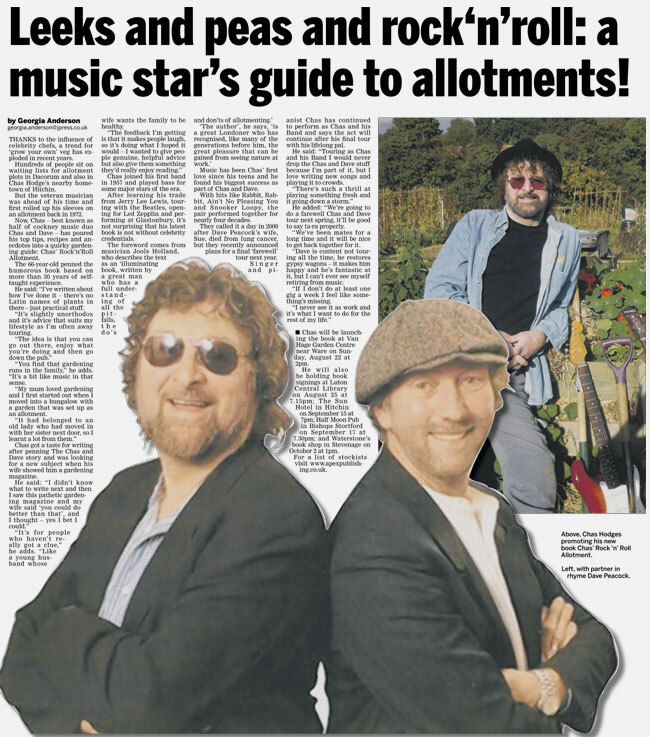 Much like Chas & Dave’s musical legacy, allotment gardening has enjoyed a huge resurgence over the past decade. Previously overlooked as a pastime for retired folk, more and more householders are discovering the joys of returning to nature. The dad-of-three, who lives in Stevenage with actress wife Joan, has a busy few months ahead of him; on top of the book signings, he’s constantly on the road playing the hits with Chas And His Band. And next year, he and erstwhile partner Dave Peacock – who announced their split following Dave’s wife’s death last year – are getting together for a 30-date tour before calling it quits for good. But with so many acts embarking on their second and third “final tours”, can we really be sure that it’s the end of the road for Chas and Dave? Chas said: “This really is going to be it. I’ll be on the road for the rest of my life, but Dave loves restoring old gipsy wagons and spending time with his horses – he won’t miss it like I would if I stopped. * An Evening With Chas And His Piano takes place at the Half Moon on September 17. It starts at 8pm and tickets are £5 from Waterstone’s in South Street. To find out more or reserve a place, visit the branch or ring (01279) 508900.
Who knew it, outside his family and circle of friends who have enjoyed the fruits of his labours? 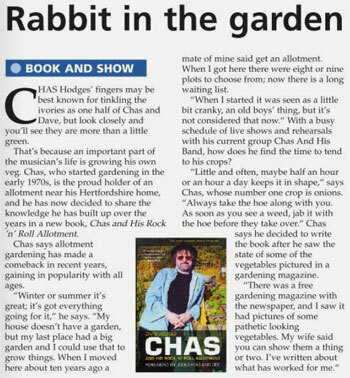 Chas Hodges (the Chas of Chas and Dave fame) is not only a rock and roll pianist, he is also a keen allotment gardener, too! This book is short for a gardening book, weighing in at only 112 pages. A good deal less than many other gardening books. In fact, Chas makes reference to this in his introduction. It is his opinion that many gardening authors pad their works out in order to provide a book of the length required by the publisher. And having read through several gardening books, I feel that Chas may have a point! Because although Chas' book is short on verbiage and has an admittedly fairly short word count, it is heavy, if not rich, with somewhat detailed instructions on how to become a reasonably proficient allotment gardener. I am a novice (my wife is the expert gardener in our family, with hard-earned qualifications in professional gardening!) so I read the book with great interest. Could I grow vegetables? 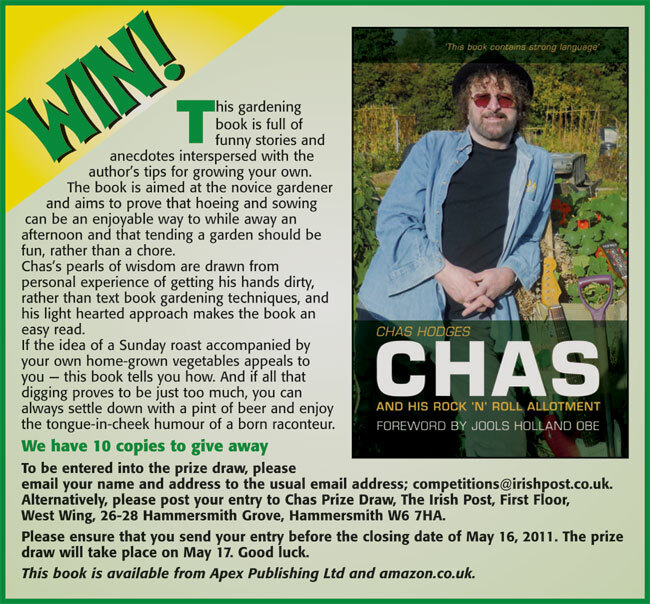 After reading Chas' book I feel that I really could have a go at growing some vegetables for the table! Chas provides information on what gardening tools you probably will require and also points out which gardening tools you probably will not require. He also gives useful hits on basic digging techniques, on the right and wrong way to keep chickens, what crops to try planting and what, in his experience, you should avoid planting in your allotment and vegetable garden. Having read the book I feel that I, a comparative novice, could make reasonable stab at not only planting crops, of tending them, harvesting the fruits of my labours and also how to store my vegetables and how to prepare them. There's also some very useful tips of pickling, too. The book also touches on the triumphs and tragedies of Chas' East End family. And beer! 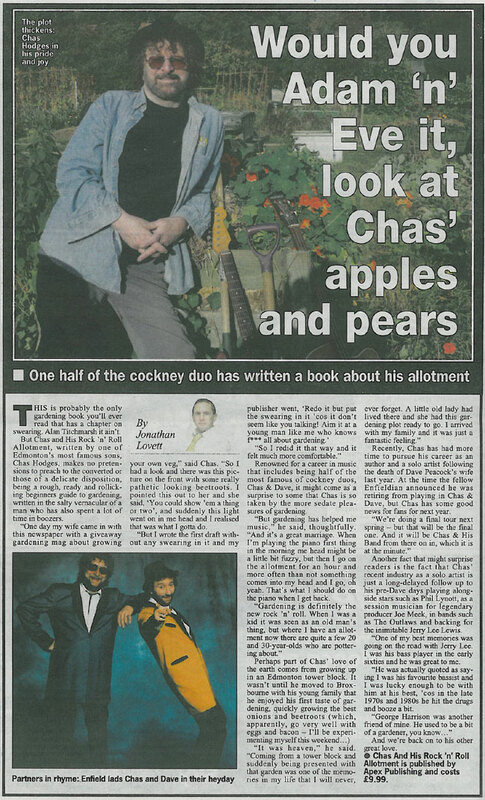 The book has an introduction by Jools Holland OBE which is a heartfelt plea for more people to grow their own vegetables like Chas does. There's a word of caution, however. If you are thinking of buying this book as a present (it's a marvellous stocking filler or birthday gift for a new gardener, or even an experienced gardener, come to that!) please do be aware that Chas uses swearwords to a prodigious, nay, industrial degree! It is the first gardening book that I have read that bears the warning: "This book contains strong language." Mind you, it's one of the few gardening books that made me think: "Yes! I could do that!" It is published by Apex, http://www.apexpublishing.co.uk at £9.99. AS he gets older Chas Hodges, one half of the iconic Chas & Dave, appearing at Ludlow Assembly Rooms next week, has no intention of slowing down. Quite the opposite. He is currently to be seen in two incarnations on the silver screen in Telstar, the story of the world’s first independent record producer Joe Meek, and released a solo album, Chas Hodges. Chas, who in the early 70s was in a band called The Outlaws, and a major session bass player at Joe Meek’s famous home studio, is played in the movie by Ralf Little, but also appears on screen himself in a cameo role. 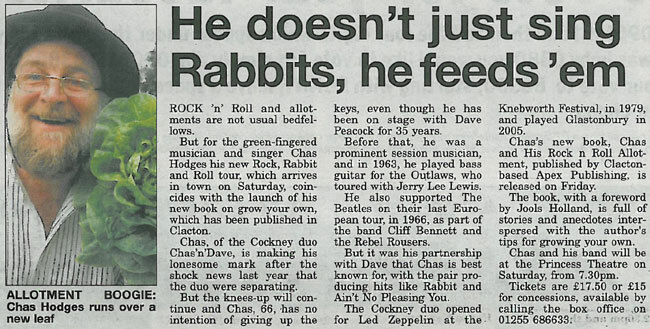 Contrary to some perceptions, Chas & Dave didn’t fall straight out of the pub into the pop charts back in 1975, but were experienced professional musicians, in Chas’s case since he was 16, both playing in Cliff Bennett’s Rebel Rousers. When he saw Jerry Lee Lewis playing at the Edmonton Regal in 1958 he decided the piano was the instrument for him and rock ‘n’ roll was the future. A Chas & Dave gig these days offers great value for money, with the Chas Hodges Band appearing on the same bill, giving fans the opportunity to hear the album live. The solo venture certainly doesn’t mean the end of Chas & Dave and their unique style, though. “Dave wanted to cut down a bit, but the older I get the more enthusiastic I get,” said Chas. 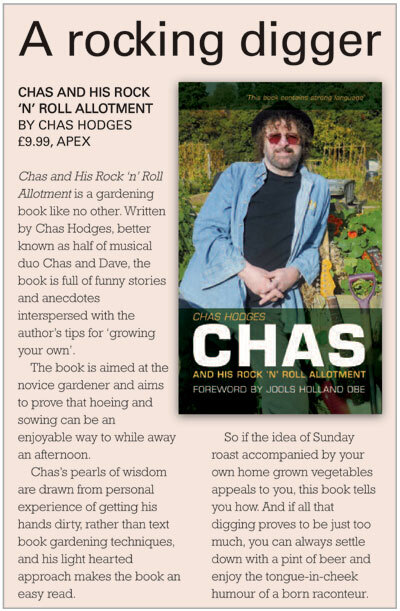 It’s an enthusiasm that extends beyond music and, having written Chas & Dave: The Two of Us, Chas has now written a book about another of his passions, Chas’s Rock ’n’ Roll Allotment. “I’ve kept an allotment for years,” he explains. “I started when the kids were young, and I got my present one in 2000. I laughed my head off reading it. I am sure it will be a hit with men on the allotments but I'll have to warn the little old ladies not to take offence. 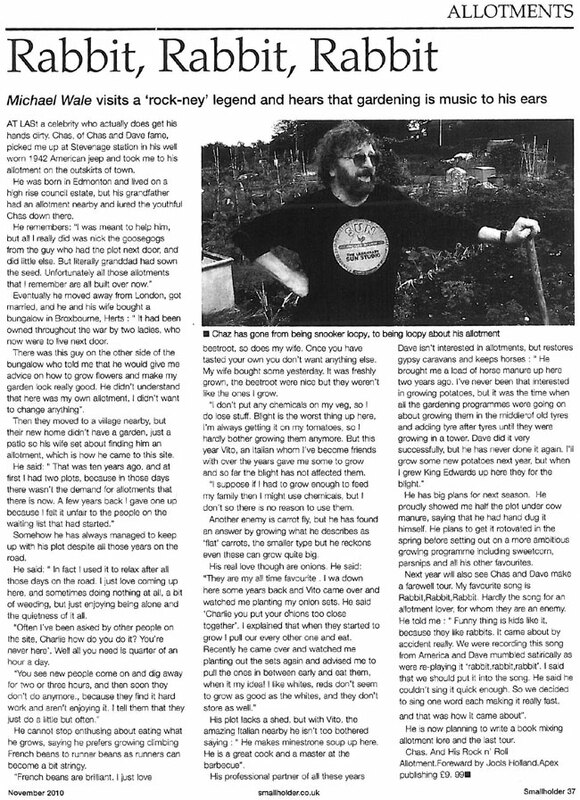 Chas of Chas and Dave fame unearths his passion for growing his own down the allotment, along with a few anecdotes thrown in from his music career. In fact, more of that instead of some of the gardening stuff would have made it worth the cover price. It's billed as a simple guide for the novice but if the thought of getting your hands dirty in order to stock up on veg bores the cauli off your flower, give it a miss. 12 May 2010 - Chas Hodges was interviewed on Wolverhampton City Radio 101.8 FM. Chas answered questions about his book 'Chas and His Rock 'n' Roll Allotment'. 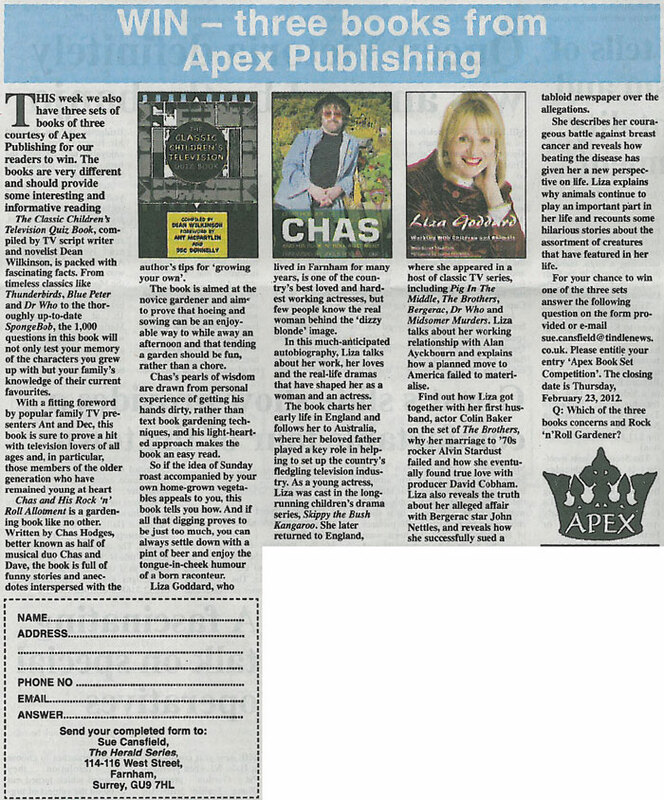 Chas was interviewed on 'The Philip Solomon Show'. 27 July 2010 - Chas Hodges was interviewed on Harborough 102.3 FM. Chas answered questions about his book 'Chas and His Rock 'N' Roll Allotment'. 27 July 2010 - Chas Hodges was interviewed on BBC Radio Stoke 94.6 FM. Chas answered questions about his book 'Chas and His Rock 'N' Roll Allotment'. 28 July 2010 - Chas Hodges was interviewed on BBC Radio Kent 96.7 FM. Chas answered questions about his book 'Chas and His Rock 'N' Roll Allotment' and also sang a few songs. 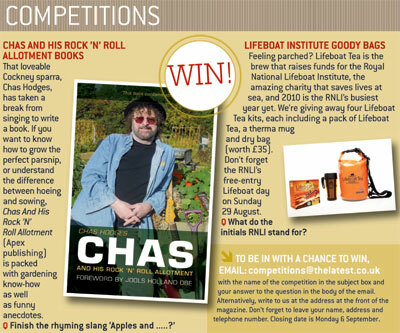 29 July 2010 - Chas Hodges was interviewed on Moray Firth Radio 97.4 FM. Chas answered questions about his book 'Chas and His Rock 'N' Roll Allotment'. 31 July 2010 - Chas Hodges was interviewed on BBC Radio Leeds 102.7 FM. Chas answered questions about his book 'Chas and His Rock 'N' Roll Allotment'. 2 August 2010 - Chas Hodges was interviewed on BBC Radio Essex 103.5 & 95.3 FM. Chas answered questions about his book 'Chas and His Rock 'N' Roll Allotment'. 3 August 2010 - Chas Hodges was interviewed on BBC Radio Cornwall 95.2 FM. Chas answered questions about his book 'Chas and His Rock 'N' Roll Allotment'. 3 August 2010 - Chas Hodges was interviewed on BBC Radio York 103.7 FM. Chas answered questions about his book 'Chas and His Rock 'N' Roll Allotment'. 3 August 2010 - Chas Hodges was interviewed on BBC Radio Cumbria 95.6 FM. Chas answered questions about his book 'Chas and His Rock 'N' Roll Allotment'. 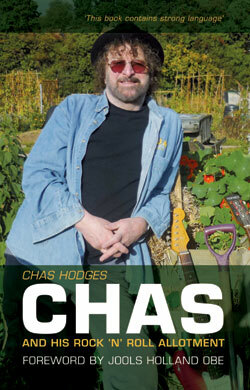 3 August 2010 - Chas Hodges was interviewed on Manx Radio 97.2 FM. Chas answered questions about his book 'Chas and His Rock 'N' Roll Allotment'. 4 August 2010 - Chas Hodges was interviewed on BBC Radio Leicester 104.9 FM. Chas answered questions about his book 'Chas and His Rock 'N' Roll Allotment'. 4 August 2010 - Chas Hodges was interviewed on BBC Radio Surrey 104 FM. Chas answered questions about his book 'Chas and His Rock 'N' Roll Allotment'. 4 August 2010 - Chas Hodges was interviewed on BBC Radio Essex 103.5 & 95.3 FM. Chas answered questions about his book 'Chas and His Rock 'N' Roll Allotment'. 5 August 2010 - Chas Hodges was interviewed on BBC Radio Northampton 104.2 FM. Chas answered questions about his book 'Chas and His Rock 'N' Roll Allotment'. 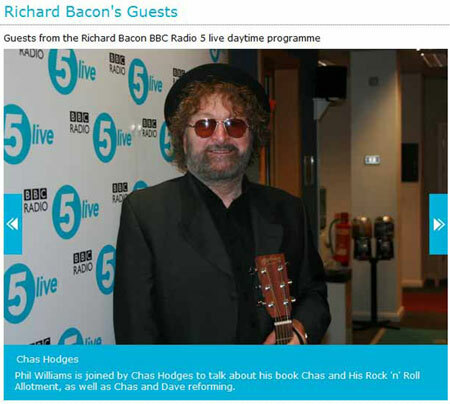 5 August 2010 - Chas Hodges was interviewed on BBC Radio 5 Live 909 MW. Chas answered questions about his book 'Chas and His Rock 'N' Roll Allotment'. (Picture: Chas Hodges at the BBC Radio 5 Live 909 MW offices). 7 August 2010 - Chas Hodges was interviewed on BBC Radio Cambridgeshire 95.7 FM. Chas answered questions about his book 'Chas and His Rock 'N' Roll Allotment'. 8 August 2010 - Chas Hodges was interviewed on BBC Radio Northampton 104.2 FM. Chas answered questions about his book 'Chas and His Rock 'N' Roll Allotment'. 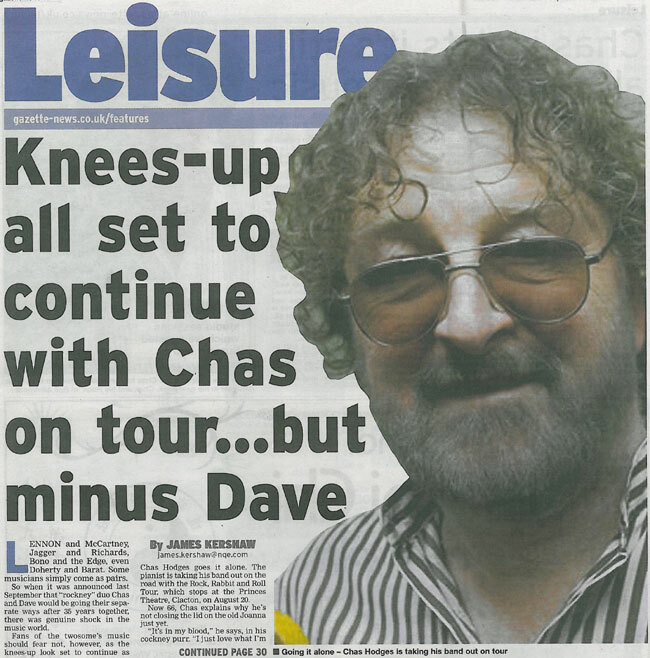 9 August 2010 - Chas Hodges was interviewed on Express 93.7 FM. Chas answered questions about his book 'Chas and His Rock 'N' Roll Allotment'. 9 August 2010 - Chas Hodges was interviewed on BBC Radio Manchester 95.1 FM. Chas answered questions about his book 'Chas and His Rock 'N' Roll Allotment'. 11 August 2010 - Chas Hodges was interviewed on Future Radio 96.9 FM. Chas answered questions about his book 'Chas and His Rock 'N' Roll Allotment'. 11 August 2010 - Chas Hodges was interviewed on Demon 107.5 FM. Chas answered questions about his book 'Chas and His Rock 'N' Roll Allotment'. 12 August 2010 - Chas Hodges was interviewed on Sine 102.6 FM. Chas answered questions about his book 'Chas and His Rock 'N' Roll Allotment'. 27 August 2010 - Chas Hodges was interviewed on Andover Sound 106.4 FM. Chas answered questions about his book 'Chas and His Rock 'N' Roll Allotment'. 14 August 2010 - Chas Hodges was interviewed on BBC Radio 4. Chas answered questions about his book 'Chas and His Rock 'N' Roll Allotment'. Chas was interviewed on 'The Jo Bunting Show'. Highly recommended, I loved it! 15 August 2010 - Chas Hodges was interviewed on BBC Radio Merseyside 95.8 FM. Chas answered questions about his book 'Chas and His Rock 'N' Roll Allotment'. 16 August 2010 - Chas Hodges was interviewed on BBC Radio Somerset 95.5 FM. Chas answered questions about his book 'Chas and His Rock 'N' Roll Allotment'. 16 August 2010 - Chas Hodges was interviewed on BBC Radio Cumbria 95.6 FM. Chas answered questions about his book 'Chas and His Rock 'N' Roll Allotment'. 16 August 2010 - Chas Hodges was interviewed on BBC Radio Coventry & Warwickshire 94.8 FM. Chas answered questions about his book 'Chas and His Rock 'N' Roll Allotment'. 16 August 2010 - Chas Hodges was interviewed on BBC Radio Devon. Chas answered questions about his book 'Chas and His Rock 'N' Roll Allotment'. 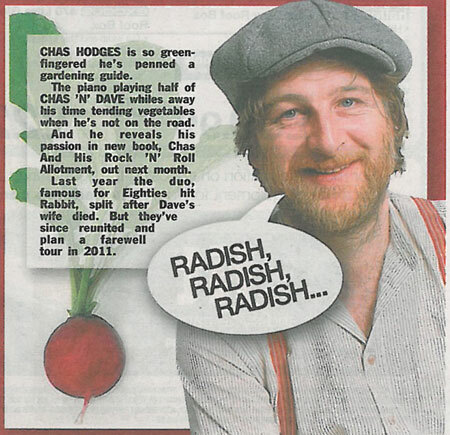 17 August 2010 - Chas Hodges was interviewed on BBC Radio 6 Music. Chas answered questions about his book 'Chas and His Rock 'N' Roll Allotment'. 17 August 2010 - Chas Hodges was interviewed on BBC Radio Sussex. Chas answered questions about his book 'Chas and His Rock 'N' Roll Allotment'. 18 August 2010 - Chas Hodges was interviewed on BBC Three Counties Radio by Sue Marchant. Chas answered questions about his book 'Chas and His Rock 'N' Roll Allotment'. 19 August 2010 - Chas Hodges was interviewed on Forest 92.3 FM. Chas answered questions about his book 'Chas and His Rock 'N' Roll Allotment'. 20 August 2010 - Chas Hodges was interviewed on BBC Radio London 94.9 FM. Chas answered questions about his book 'Chas and His Rock 'N' Roll Allotment'. 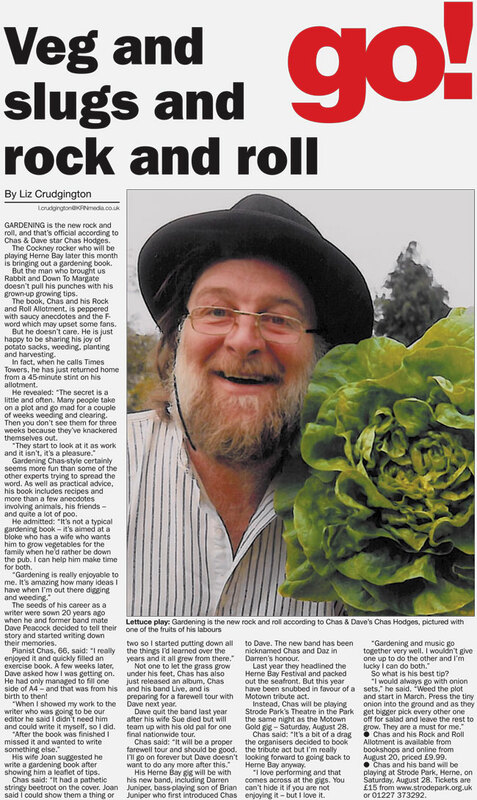 20 August 2010 - Chas Hodges was interviewed on BBC Radio Shropshire 96 FM. Chas answered questions about his book 'Chas and His Rock 'N' Roll Allotment'. 20 August 2010 - Chas was interviewd on LBC 97.3 FM. 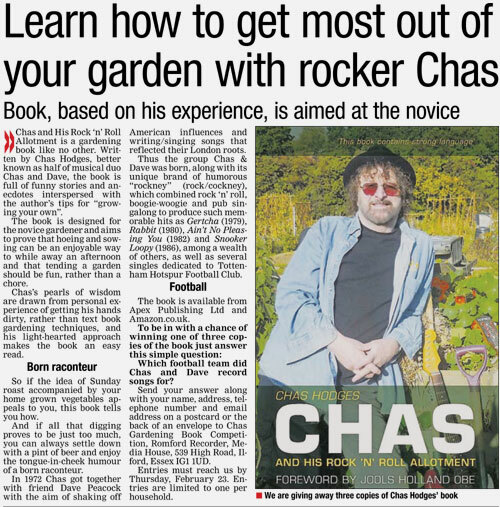 Chas talked about his career and answered questions about his book 'Chas and His Rock 'N' Roll Allotment'. 20 August 2010 - Chas Hodges was interviewed on London Tonight, ITV. Chas answered questions about his book 'Chas and His Rock 'N' Roll Allotment'. 21 August 2010 - Chas Hodges was interviewed on BBC Radio Norfolk 95.1 FM. Chas answered questions about his book 'Chas and His Rock 'N' Roll Allotment'. 21 August 2010 - Chas Hodges was interviewed on BBC Radio 2 88-91 FM. Chas answered questions about his book 'Chas and His Rock 'N' Roll Allotment'. Chas was interviewed on 'The Patrick Kielty Show'. 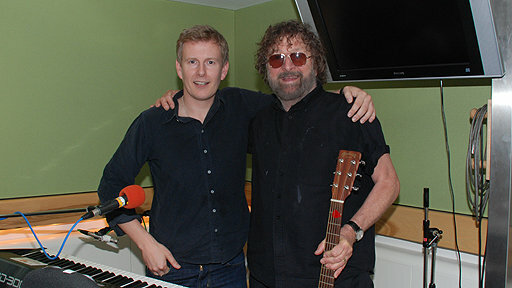 (Picture: Chas Hodges with Patrick Kielty at the BBC 2 studios). The greatest gardening book of all time. Chas is the Gordon Ramsey of gardening. The book is genius! 23 August 2010 - Chas Hodges was interviewed on Wolverhampton City Radio 101.8 FM. Chas answered questions about his book 'Chas and His Rock 'N' Roll Allotment'. I am currently reading it and I LOVE IT! So funny but soooo useful! And, I actually UNDERSTAND IT! 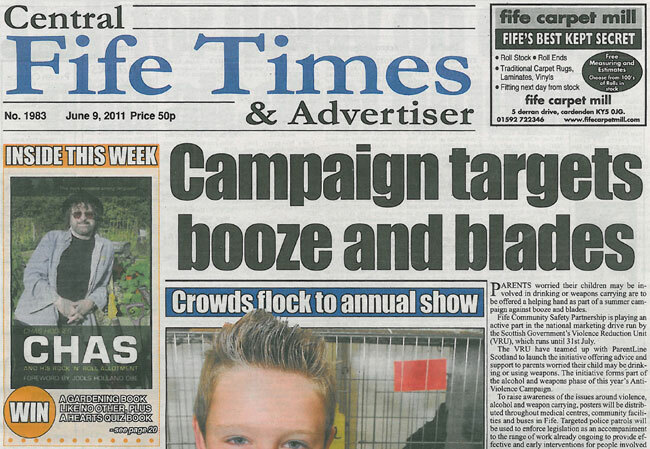 25 August 2010 - Chas Hodges was interviewed on Leith 98.8 FM. Chas answered questions about his book 'Chas and His Rock 'N' Roll Allotment'. 26 August 2010 - Chas Hodges was interviewed on Country Mix Radio 106.8 FM. Chas answered questions about his book 'Chas and His Rock 'N' Roll Allotment'. 26 August 2010 - Chas Hodges was interviewed on Lionheart Radio 107.3 FM. Chas answered questions about his book 'Chas and His Rock 'N' Roll Allotment'. 27 August 2010 - Colchester Garrison 107 FM feature and run a competition on Chas Hodges' book 'Chas and His Rock 'N' Roll Allotment'. 1 September 2010 - Chas Hodges was interviewed on The Wright Stuff, Channel 5. Chas answered questions about his book 'Chas and His Rock 'N' Roll Allotment'. 1 September 2010 - Chas Hodges was interviewed on BBC Radio Newcastle 95.4 FM. Chas answered questions about his book 'Chas and His Rock 'N' Roll Allotment'. 5 September 2010 - Chas Hodges was interviewed on BBC Radio Surrey 104 FM. Chas answered questions about his book 'Chas and His Rock 'N' Roll Allotment'. 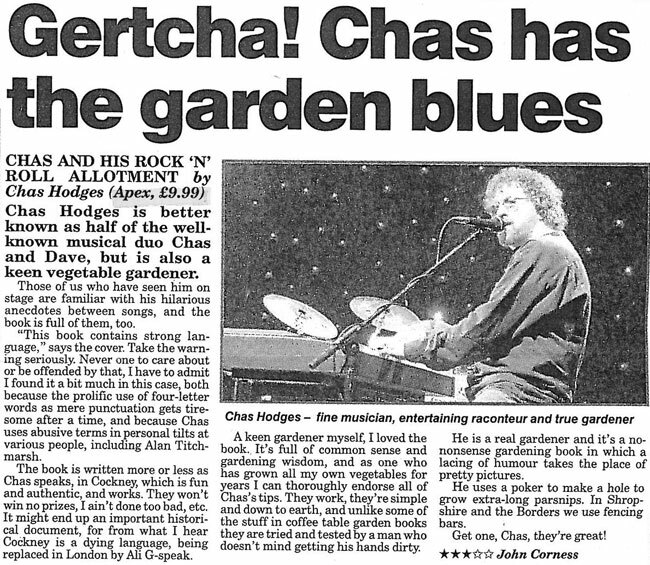 8 September 2010 - Chas Hodges was interviewed on BBC Radio Hereford and Worcester 104 FM. Chas answered questions about his book 'Chas and His Rock 'N' Roll Allotment'. 8 September 2010 - Chas Hodges was interviewed on Bristol Community Radio 93.2 FM. Chas answered questions about his book 'Chas and His Rock 'N' Roll Allotment'. 26 September 2010 - Chas Hodges was interviewed on Pure 107.8 FM. Chas answered questions about his book 'Chas and His Rock 'N' Roll Allotment'. 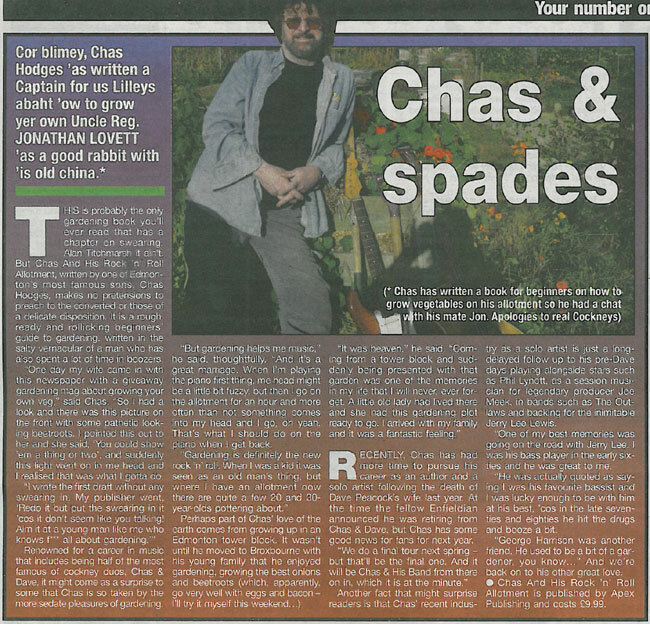 11 October 2010 - Chas Hodges was interviewed on Bristol Community Radio 93.2 FM. Chas answered questions about his book 'Chas and His Rock 'N' Roll Allotment'. 12 October 2010 - Chas Hodges was interviewed on Mansfield 103.2 FM. Chas answered questions about his book 'Chas and His Rock 'N' Roll Allotment'. 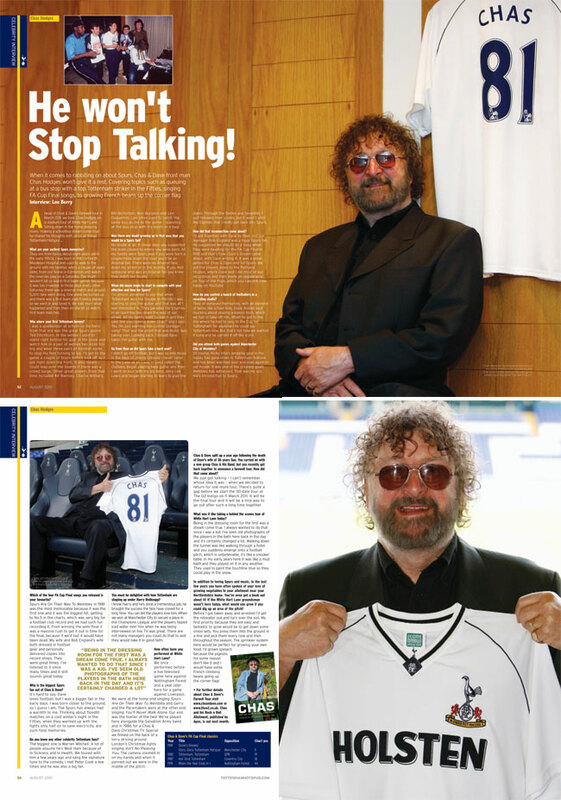 17 October 2010 - Chas Hodges was interviewed on The Eye 103 FM. Chas answered questions about his book 'Chas and His Rock 'N' Roll Allotment'. 18 October 2010 - Chas Hodges was interviewed on Pulse Radio 98.4 FM. Chas answered questions about his book 'Chas and His Rock 'N' Roll Allotment'. 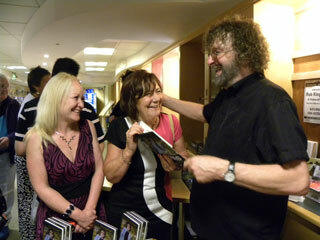 28 February 2011 - Chas Hodges was interviewed on The Vanessa Show, Channel 5. Chas answered questions about his book 'Chas and His Rock 'N' Roll Allotment'. 13 February 2011 - Chas Hodges was interviewed on BBC Radio 4. Chas answered questions about his book 'Chas and His Rock 'N' Roll Allotment'. I couldn’t put this book down, a very good read indeed. 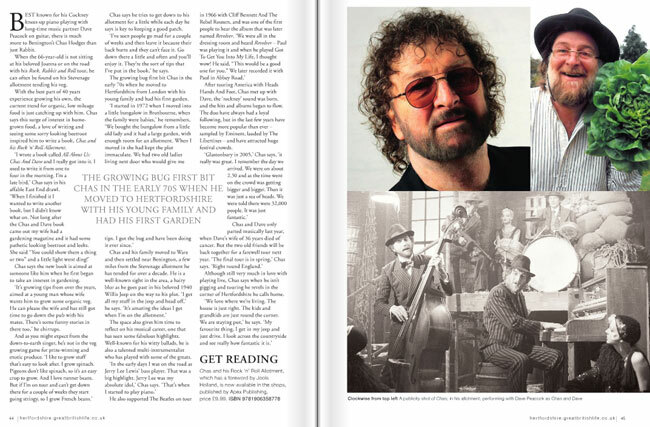 It shows Chas Hodges in a different light, exposing his witty and sensitive nature and although famous in the music world, he has not forgotten his roots (excuse the pun) or background. I loved it! 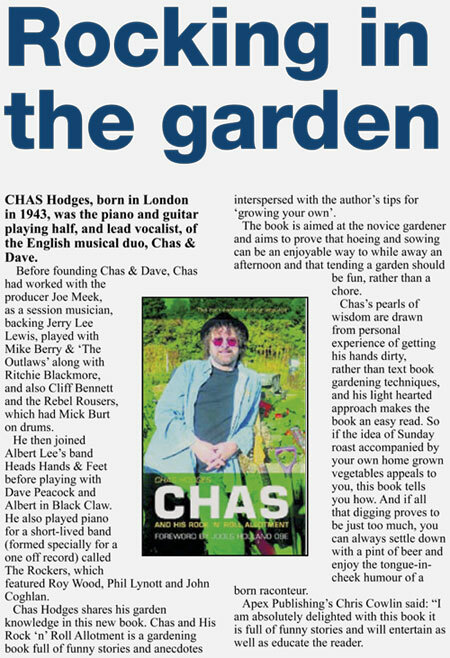 A great book from Chas Hodges. 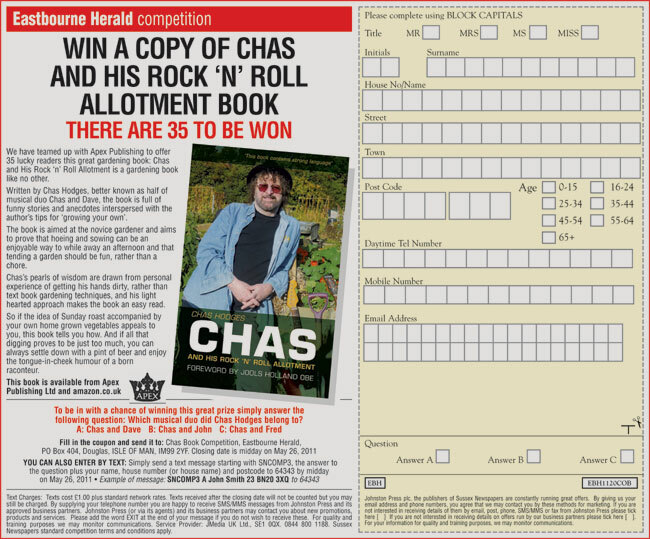 21 August 2010 - Chas Hodges signed copies of his book 'Chas and His Rock 'N' Roll Allotment' at the Princes Theatre, Clacton on Sea. 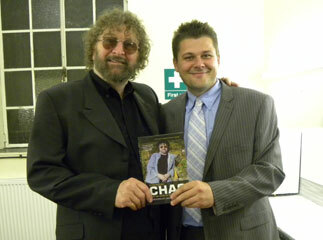 (Picture left: Chas Hodges with Apex Publishing's Chris Cowlin holding a copy of 'Chas and His Rock 'N' Roll Allotment'). 21 August 2010 - Chas Hodges signed copies of his book 'Chas and His Rock 'N' Roll Allotment' at the Princes Theatre, Clacton on Sea. 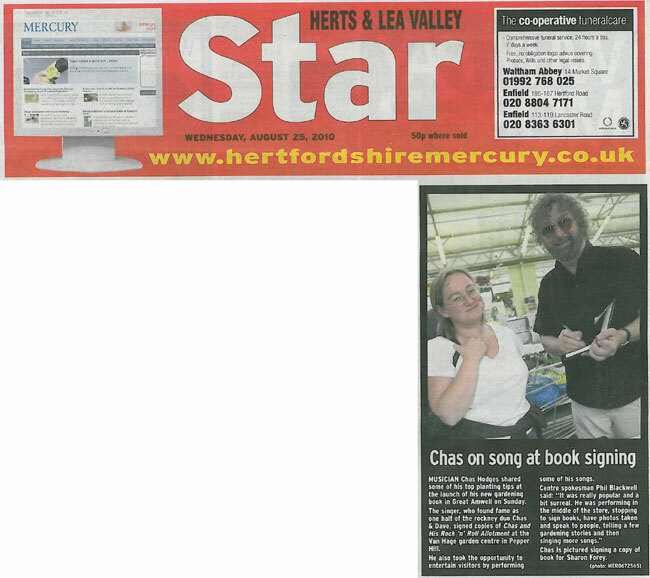 22 August 2010 - Chas Hodges signed copies of his book 'Chas and His Rock 'N' Roll Allotment' at Van Hage Garden Centre, Nr Ware, Hertfordshire. 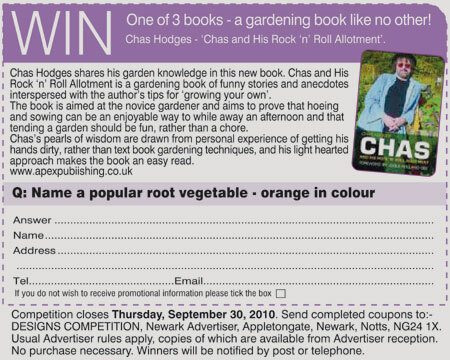 25 August 2010 - Chas Hodges signed copies of his book 'Chas and His Rock 'N' Roll Allotment' at Luton Central Library (Waterstone's, Luton). 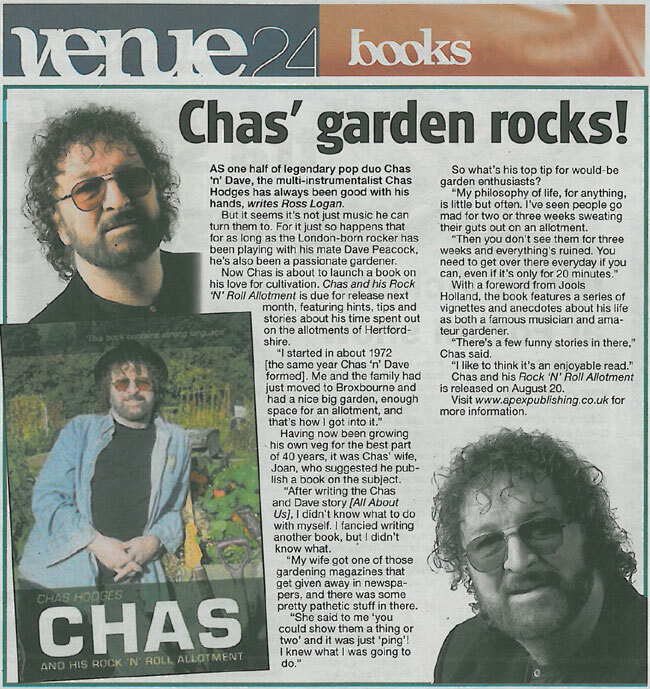 15 September 2010 - Chas Hodges signed copies of his book 'Chas and His Rock 'N' Roll Allotment' at The Sun Hotel, Hitchin (Waterstone's Hitchin). 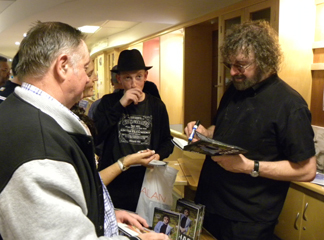 18 September 2010 - Chas Hodges talked about and signed copies of his book 'Chas and His Rock 'N' Roll Allotment' at Rhodes Arts Complex, Bishops Stortford. 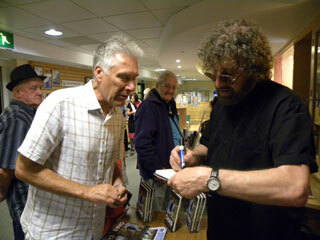 2 October 2010 - Chas Hodges signed copies of his book 'Chas and His Rock 'N' Roll Allotment' at Waterstone's, Stevenage. 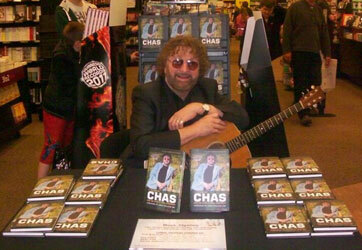 12 May 2011 - Chas Hodges signed copies of his book 'Chas and His Rock 'N' Roll Allotment' at Bookmark, Spalding. 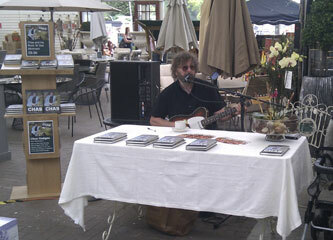 28 August 2011 - Chas Hodges signed copies of his book 'Chas and His Rock 'N' Roll Allotment' at Van Hage Garden Centre, Ware. 1 October 2011 - Chas Hodges signed copies of his book 'Chas and His Rock 'N' Roll Allotment' at Codicote Garden Centre, Codicote.